Feelings of sadness, irritability, hopelessness, worthlessness or having difficulty concentrating can happen to anyone, regardless of age. But if you notice these feelings continuing for longer than a few weeks, you may be depressed. Sometimes, depression can also include thoughts of wanting to harm yourself or even suicide. In this case, it’s really important that you talk to a trusted adult who can help you. It is also normal to feel nervous or worried especially if you’re in a new or stressful situation, like when you take a test. But if you’re so worried you can’t focus on anything but what you’re anxious about, you should talk to an adult you trust. When you’re feeling especially sad or worried, you may want to be alone, but the most useful thing to do is reach out to a trusted adult. Sometimes you just need someone to talk to. If you can’t seem to shake feeling sad or worried, there is nothing wrong with you, though you may be depressed or anxious. It’s important to know that you aren’t alone and you can get help if you need it. Occasional sadness or worry are normal parts of life, as is some emotional fluctuation during puberty. This moodiness is often due to the increase in hormones that happens with the physical changes of puberty. We also know that young people can experience anxiety as their bodies change, they experience new social situations and they deal with the normal challenges of school, like test taking. Occasional anxiety about these situations is totally normal. But if you notice your child’s sadness, irritability or anxiety affecting their ability to function and continuing for longer than a few weeks, they may need some extra help. Hopelessness, difficulty concentrating, feelings of worthlessness and changes in sleep or eating patterns are also signs that your child may need additional support. Sometimes, depression can include thoughts about self-harm or suicide. If your child mentions wanting to hurt themselves, it’s important you immediately seek professional help for your child. You can speak with your child’s health care provider or in a crisis call the Suicide Prevention Lifeline at 1-800-273-8255. If your child is struggling emotionally, they may want to isolate themselves. Keep the lines of communication open with your child. Reassure them that prolonged periods of feeling sad or worried may mean they are depressed or anxious, but this doesn’t mean anything is wrong with them or that they have done anything wrong. Let your child know that you will work with them to get the support and treatment they need to feel better. It seems like you have been really sad for a while. Can we talk about it and figure out what we can do together to make it better? I noticed that you’ve been worried about X lately. I’d like to help you feel less worried. I’m here for you when you’re sad, anxious or scared and want to do what I can to help. Let’s talk about ways I can do that. It looks like you’ve been feeling bad lately. I feel sad and worried too, sometimes. There are ways to feel better. Occasional sadness or worry are normal parts of life, as is some emotional fluctuation during puberty. This moodiness is often due to the increase in hormones that happens with the physical changes of puberty. We also know that young people can experience anxiety as their bodies change, they experience new social situations and they deal with the normal challenges of school, like test taking. Occasional anxiety about these situations is totally normal. But if you notice a student’s sadness, irritability or anxiety affecting their ability to function and continuing for longer than a few weeks, they may need some help. Difficulty concentrating, acting withdrawn, impulsivity, lethargy, changes in grades or behavior are also signs that a student may need additional support. Sometimes, depression can include thoughts about self-harm or suicide. If a student mentions wanting to hurt themselves, it’s important that you immediately report this and make sure district protocols are followed to get the student professional help. A student who is struggling emotionally may want to isolate themselves. But if a student confides in you about having prolonged periods of feeling depressed or anxious, reassure the student that this can happen and that it doesn’t mean anything is wrong with them. Follow your school’s protocols and get the student help. Let the student know that you will work with them to get the support they need. The video stated that if you had certain feelings for more than a week, you might be depressed. What were some of the feelings that were mentioned? 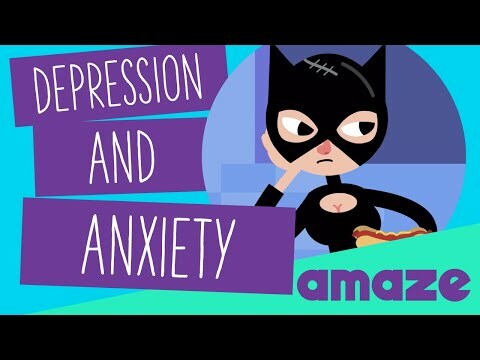 The video stated that if you had certain feeling for more than a week, you might have an anxiety disorder. What were some of the feelings that were mentioned? Why is it important to talk to a trusted adult if you’re experiencing any of these feelings for longer than a week? Who are some trusted adults that a person can talk with if they are experiencing these feelings? What are some things a person could say to start this conversation with a trusted adult?